Learn how to use spices in your everyday life to support your health. We will explore 7 spices for their medicinal properties but also for their ability to enhance the taste and smell of our food, bringing life to our mealtimes. 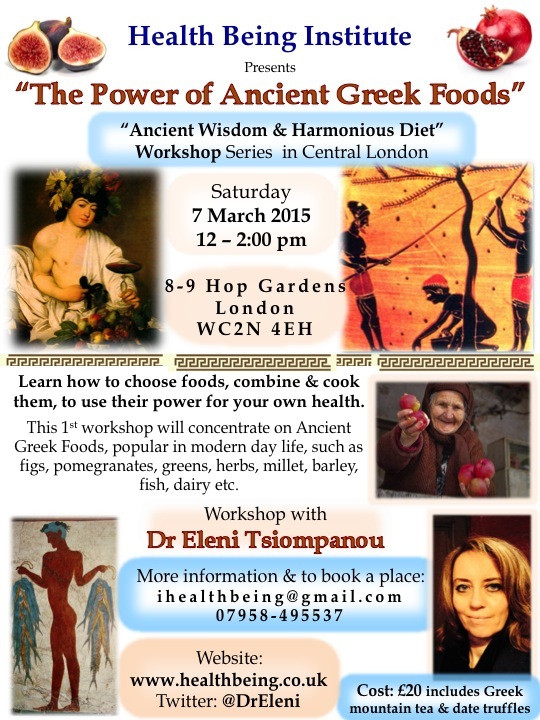 “Food is Medicine”, Hippocrates the wise Greek physician of the 5th century BC wrote. When I was researching his books for my thesis, I found quotes such as ‘Coriander is hot and astringent; it stops heartburn, and when eaten last also causes sleep’ and ‘Wild saffron passes by stool’. Spices were differentiated according to their taste and the effect they had on the body. Clearly the ancients also used spices for their medicinal purposes. They recognised spices had an effect in the body and used them accordingly. Modern science confirms the powerful properties of spices. Eating a tasty, aromatic, colourful, nutritious meal in a quite, pleasant environment and with attention is a powerful holistic experience that nourishes the body, mind and spirit. When we leave out one of these factors, then we feel like we are missing something and turn to more food or other substances and experiences to make up for the loss and to seek happiness. This has led in the 21st century to the epidemic of obesity and other chronic diseases. Spices can be one of the factors that can save us from disease and poor quality of being. 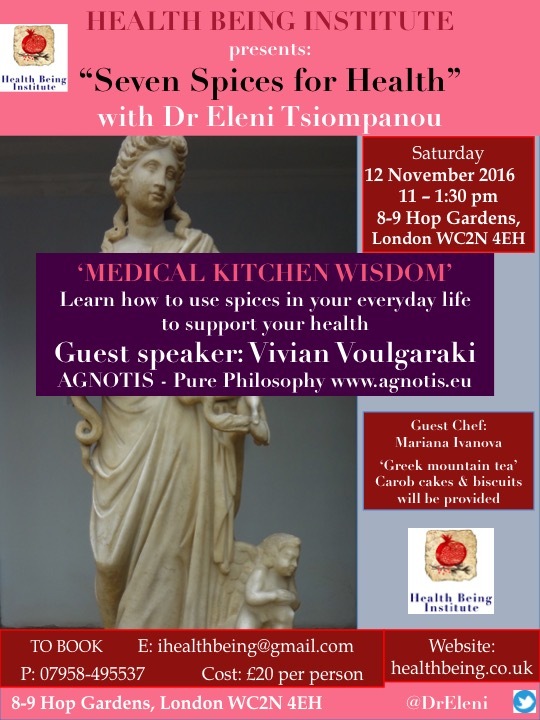 For this workshop I am very happy to welcome my guest speaker Vivian Voulgaraki. Vivian was born and raised in the island of Crete. Her journey in life brought her back to her roots where she set up “Pure Philosophy”, a private company that produces Holistic skin care and nutrition products and promotes natural and healthy living with respect to animals and nature. She will talk to us about a very special spice called carob which she has researched. The story of carobs has a special meaning for Greeks, as the consumption of carobs saved a lot of people and children during the war period and austerity. Evidently, this spice has special properties which Vivian will discuss further. Please join us for this special event and taste a caramelised carob cake and raw carob gluten and dairy free biscuits, made using Vivian’s organic Carob syrup and powder, prepared by our chef Mariana Ivanova. Recipes will be provided. What could we do to prevent dementia and even delay its’ progress? Research shows what’s good for the heart and the gut is good for the brain. 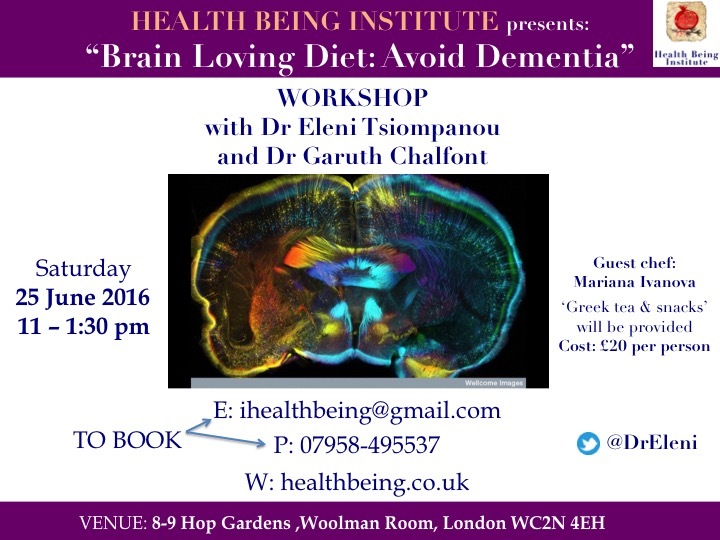 Come and join us on Saturday 25th June 11am-1:30pm at this unique workshop in the centre on London. Along with an interesting discussion, we offer ideas for cooking (“brain loving foods”) and some delicious snacks designed to nourish your heart and brain, prepared by chef Mariana Ivanova. Walking v Running – which is the healthiest? While I was away, I read some interesting articles about the relative benefits of walking and running. This was of interest to me, as I had taken the advice of Eleni Tsiompanou, the integrative doctor at Penny Brohn, to stop running some time ago.Overall, it seems the benefits of a 5-minute run, match those of a 15-minute walk. Broadly speaking, it seems the benefits associated with a 25-minute run are equivalent to walking for 1 hour 45 minutes. Obviously if you are young healthy and reasonably fit, running is more time-efficient. Or is it? With running there is time spent getting changed twice and showering afterwards. (Assuming that you have a healthy attitude to personal hygiene) Plus, there is the time stretching (before and/or after running) and maybe even cooling down. So a 15-minute run could, in reality, easily take an hour out of one’s day. This is significantly more time than that devoted to say, a 45-minute walk (which, generally, will require no changing, stretching or showering) and you spend all the time outside!Runners may also be prone to injury. I know from first hand experience about this. When I used to run a lot, I had a succession of running related injuries (shin splints, right calf, lower back, to name a few), which was one of the reasons which eventually led me to think about giving up running.Prior to my liver resection in February 2011, I had a personal trainer who was helping me get fit again, after a year of very gentle exercise. My aim was to run a 10km race and raise money for cancer charities. I was feeling great and beginning to enjoy the running. Then I was diagnosed with a metastasise in my liver. It required surgery. I had to stop the running while I recovered from my surgery. That March as part of my post op recovery, I went to Penny Brohn for a few days. During which I saw Eleni Tsiompanou ( an Intergrative Health Doctor) and we discussed the subject of exercise and how much was advisable. I told her what my plans were and that I hoped to get back to running again soon. I was not expecting what she said. I remember her words “Running – no way – this is far too much for you. Walking – most definitely and as much as you like. But running no”. I was confused! The reason, she explained to me, was that my immune system was having a difficult time dealing with fighting off the cancer cells floating around my body. Running can suppress the immune system. So if my immune system is suppressed after I run then the cancer cells can prosper. Which is not a good idea.This made sense! Cardio/aerobic (distance) running is known to (stress) suppress the immune system, You only have to think of distance runners such as Mo Farah, Paula Radcliffe who have been prone to infection illnesses . Walking can be sustained all year and can be carried on as you get older. Walking is much easier and in my experience it is more conducive to ‘social networking’. 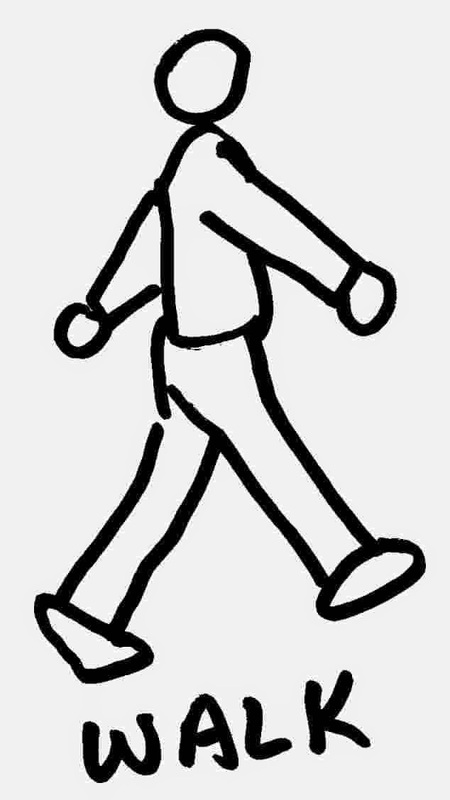 Another advantage of walking is that it can easily be incorporated into one’s daily routine. My friends are of the age when going for a walk is not too off putting. I can’t think too many of my friends who would get excited by asking them to go for a 5km run. But a walk with Colin and me seems to be OK. So I was excited by the good news that cancer patients can cut their risk of dying by up to half – simply by walking just one mile a day, according to experts. A study revealed physical activity as a ‘wonder drug’, with those diagnosed with breast and prostate cancers able to cut their risk of death by up to 40 per cent. Bowel cancer patients, need to double the walking distance to halve the risk of dying. The calculations are based on walking one mile at a moderate pace of 3mph, which would take just 20 minutes a day. The research by Walking for Health, a network of walking groups run by Macmillan Cancer Support and the Ramblers, found physical activity can also reduce the impact of some debilitating side effects of cancer treatment, such as swelling around the arm, anxiety, depression, fatigue, impaired mobility and weight changes. The charity estimates that 1.6million of the two million people living with cancer in the UK are not active at recommended levels. Thankfully I took the advice of that doctor at Penny Brohn. With the help of my new personal trainer, my doggie companion Colin, I walk every day. Whatever the weather he gets me outdoors for his walk and I have no choice but to accompany him. My friend Ruth and her dog Jazz are most mornings our companions so it has become a social networking activity. I always feel better after the early morning walk and it changes the energy I woke up with. Instead of feeling sleepy and reaching for a cup of tea to wake me up I return refreshed and keen to get on with my day. Not all of us were ‘born to run’, but almost all of us were ‘born to walk’. ! 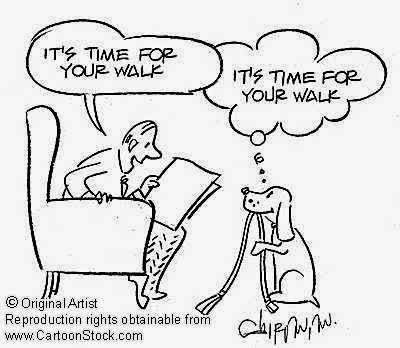 So it’s walking for me ….. and I urge you to get walking now! 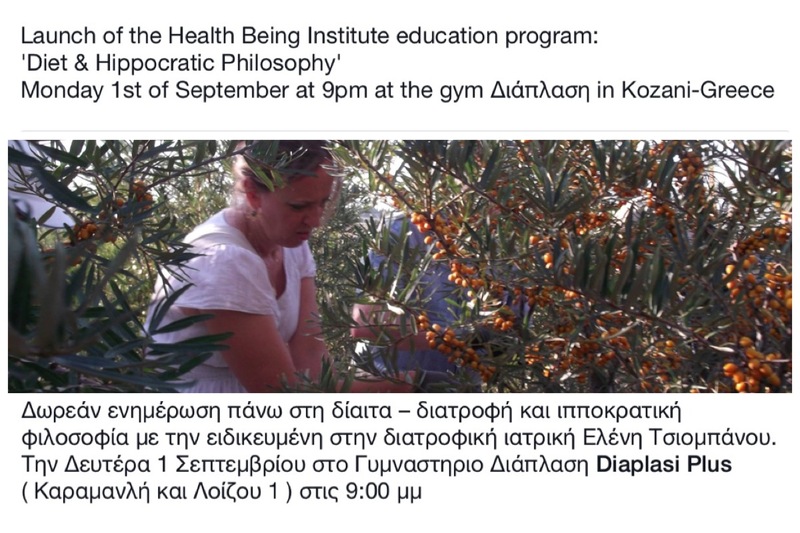 If you are interested in using diet and Ancient Greek wisdom to live a more healthy life, join the Health Being Institute education program on: “Diet and Hippocratic Wisdom”. 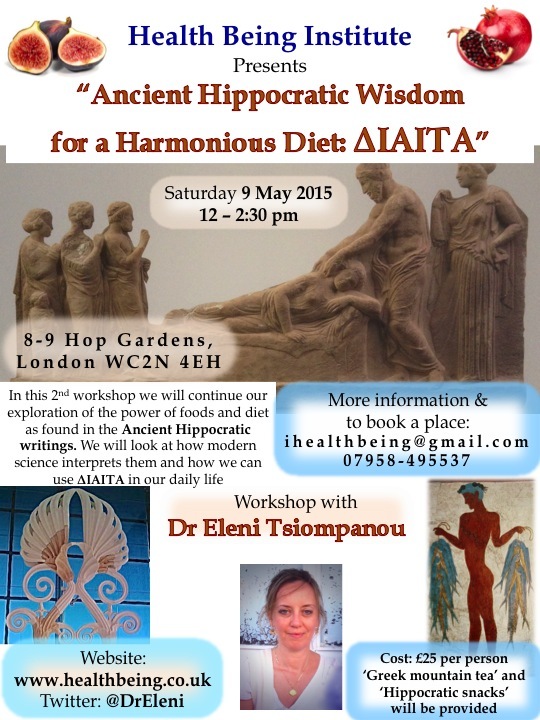 The program will be launched next Monday in the birth country of Hippocrates, Greece. A number of workshops will be given from September onwards in Central London. The main sources of vitamin B12 are animal foods. Read more in their article published in the peer review journal Nutrients. Nori is easy to use. Sprinkle it over salad or make sushi are two ways to eat it raw. It’s better not to toast it as it reduces the concentration of vitamin B12. Remember: Eat Real Food. It is always better than taking supplements. ‘Come forth into the light of things, Let Nature Be Your Teacher’. William Worsdworth’s call to be immersed in Nature comes with a promise of a deeper understanding of life and of ourselves. In this Health-Being meeting we will explore what we can learn from Nature for our Health and our Being, but also how in the modern world, our relationship with her has created problems and challenges that we cannot afford to ignore. Some say: ‘what use is Nature in the 21st century’? We simply reply that: the air that we breathe, the water that we drink and the soil in which we grow our food determine our existence. Nature can provide us with many products to sustain and support our physical, emotional and spiritual balance. 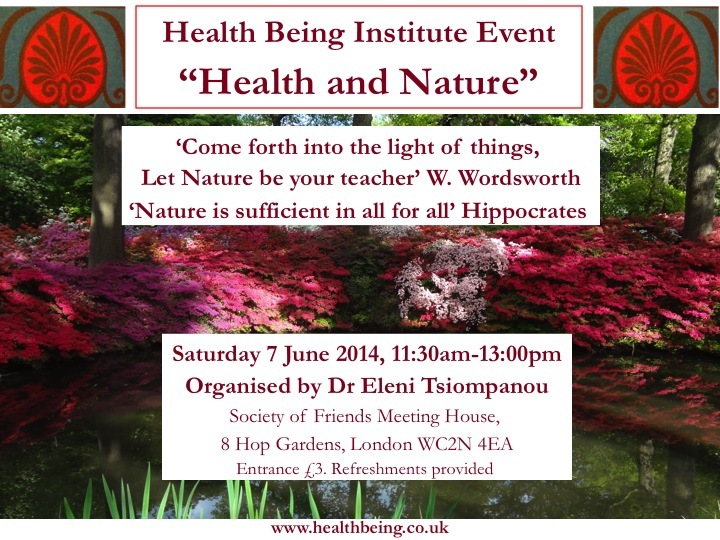 What did Hippocrates mean when he wrote: ‘a physician is first and foremost Nature’s helper’? What natural resources can we use safely to help ourselves in times of good or ill health? And what can we give back to our Mother Nature, so that she doesn’t get emptied from the energies that we so much depend on? How can we make sure that we use and not abuse our natural environment given the inextricable connection it has with human health? If we look and listen carefully to Nature’s geometry and language, we will understand everything better. This isn’t just a ‘trend’. Our future and the future of our children depends on it. You are invited to the June Health Being Event. ‘Come forth into the light of things, Let Nature Be Your Teacher’. 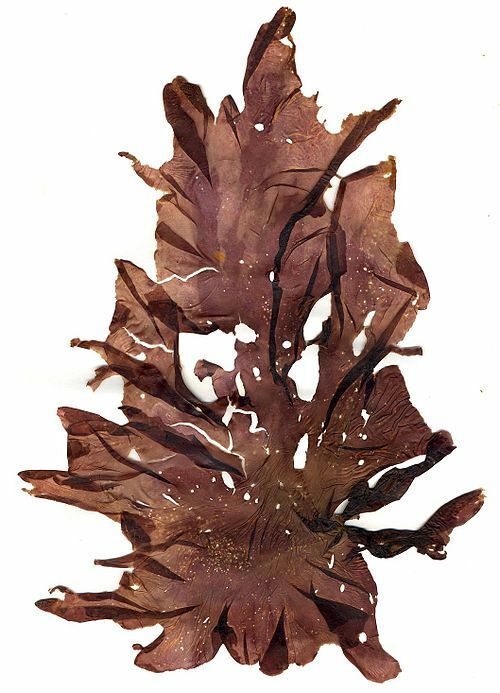 William Worsdworth’s call to be immersed in Nature comes with a promise of a deeper understanding of life and of ourselves. 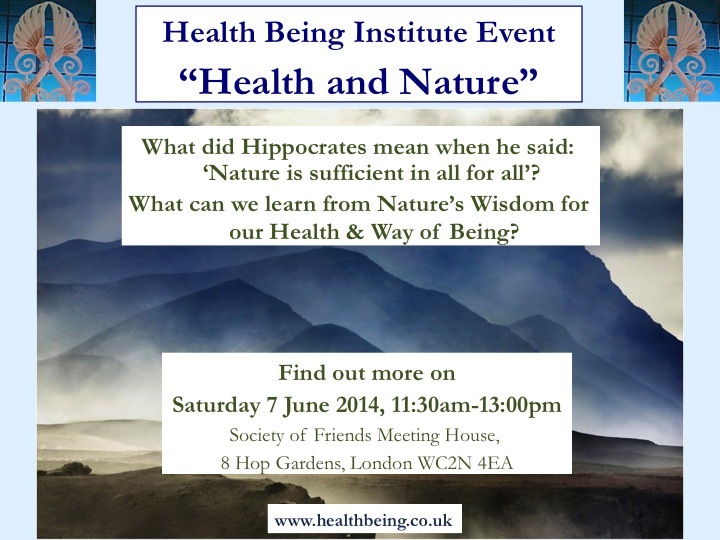 In this Health-Being event we will explore what we can learn from Nature for our Health and our Being, but also how in the modern world, our relationship with her has created problems and challenges that we cannot afford to ignore.